Southern Railway Trichy, Madurari, Salem, Perambur Chennai Recruitment 2018-2019 Application Form for 1821 Fitter, Welder, Machinist, Electrician, Mechanic Diesel, Mechanic Refrigeration & Air Conditioning, Electronics Mechanic & Programming and System Administration Assistant Posts Download Application through Official website www.sr.indianrailways.gov.in. 1821 Southern Railway Recruitment 2018 Apply Online. Southern Railway Act Apprentices Jobs Notification The last date for submission of applications is 23.02.2018. 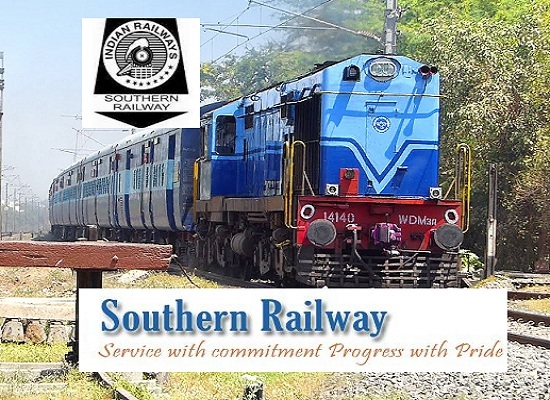 Southern Railway pattern of examination, Syllabus, Question Paper, Admit Date Release Date, etc.the stipulated criteria before Applying Online. Should have passed 8th, 10th, ITI, Diploma, Engineer Class under 10 +2 System of education and ITI course in the relevant trade in Government recognized. i) During the 1st year of training Rs.5900/-p.m.
ii) During the 2nd year of training Rs. Rs.7550/-p.m.
iii) During the 3rd year of training Rs.6700/-p.m.
iii) During the 3rd year of training Rs.7350/- p.m.